"It is likely that 2013 will be remembered as the "year of the flood," sais GUY CARPENTER's "Global Catastrophe Review, 2013" report. For the CEE region, though, also 2014 may compete for this unappealing title. Exactly one year after the historical flooding in the Balkans which cause losses of over EUR 17 billion in May-June 2013, Bosnia & Herzegovina and Serbia were drowned by torrential rainfalls which washed away lives, houses and crops causing losses of over EUR 4 billion. Shopping season about to start! The above title suggests neither the season's sales ready to begin in the big clothing shops, nor the traditional 'groceries shopping' before the winter. It is all about buying intelligence to feed your future business decisions. Flood damage could exceed EUR 11 billion a year in Europe by 2080, a study released by the European Commission recently warned, while the number of people affected by droughts could increase sevenfold, and coastal damage from sea level rise could triple. The southern region of Central Europe, where damages could rise from the present EUR 2 billion/year up to EUR 5.2 billion/year and Southern Europe, which would also experienced a considerable increase in damages totaling up to EUR 1.3 billion/year are among the most potentially affected regions under the simulation scenarios used in the EC study. There are still many regions in Europe where the summer hasn't really started. However, despite the capricious weather, many of us are on our way or preparing for the summer vacation. 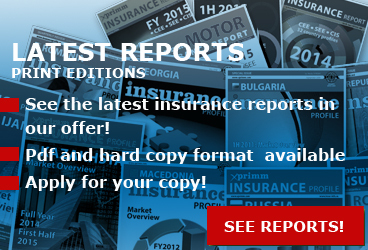 Still, preparations for this autumn's newest set of insurance reports are on their way and the studies will be waiting for you upon your return. More than 250 people representing the top management of insurance, reinsurance and brokerage companies, IT and audit, as well as government agencies and associations from the Caucasus Region, Central Asia, Europe, Turkey, Russia and CIS countries participated in AIIF 2014 - Azerbaijan International Insurance Forum. 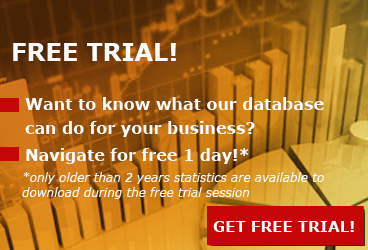 Order your copy now and save EUR 100! Is the Eastern potential still there? 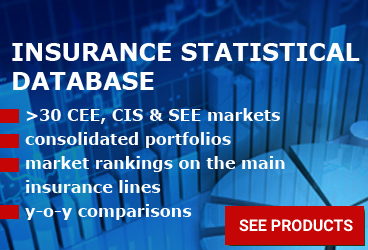 At the end of 2013, five of the major Western insurance groups operating on the CEE, CIS and Turkish markets - VIG, GENERALI, ALLIANZ, UNIQA and GROUPAMA -, were harvesting about 30% of total written premium across the region, meaning in absolute terms, about EUR 11.5 billion. At the same time, the three most important "domestic" players in the CEE - PZU, TRIGLAV and CROATIA Osiguranje -, gathered GWP of about EUR 5.3 billion while only on the Russian market, the Top 5 companies - ROSGOSSTRAKH Lyubertsy, SOGAZ, INGOSSTRAKH, RESO-GARANTIA and SOGLASIE -, totalled written premiums of over EUR 7.5 billion. Looking at these figures, it is obvious that the "Westerners" who entered the region in the last 20 years have encountered a strong competition on the Eastern markets. Under the pressure of the ever closer enforcement of the new European insurance directives in prevention, discussions about transparency, fair sales practices, solvency, customer's protection, risk control etc. were repeated to the point of becoming trivial in recent years. What says about us the insurance policy we sell? "The cars we drive say a lot about us," said once a popular character. Maybe it wouldn't be wrong to ad ... "as well as the kind of insurance we buy for it." What do Istanbul, the huge metropolis on the shores of the Bosphorus, and Brasov, the charming city in the heart of the Carpathian Mountains have in common? Probably nothing, as some would say. 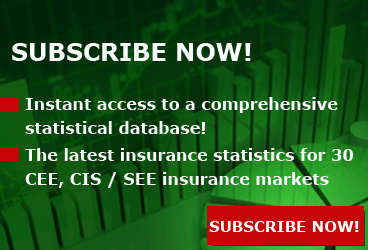 Still, from an insurance professional's perspective, there is more than meets the eye, as they are both hosts to some must-attend spring events for the insurance industry and they provide the launching stage for the latest studies regarding the CEE and CIS markets. Moscow, Vienna, Bucharest, Kiev, Prague, Istanbul and Moscow again, Amsterdam, Almaty, Tashkent, Brasov, Baku ... no, this is not the description of a leisure grand tour offered by a travel agency, but just a brief review of the business networking and learning destinations available for this spring in the Central and Eastern Europe and Central Asia. A wave of cold weather and snowstorms has hit parts of Central and Eastern Europe, disrupting the power supply, transportation and school activity, causing traffic jams and spectacular chain accidents. A large part of Romania and Bulgaria were severely hit by winter storms, while snow fell also in the center of the Adriatic region of Croatia - highly unusual considering its Mediterranean climate - and neighboring Montenegro, causing traffic problems. While drivers are hoping the snow will stop falling, insurers are uneasy looking at the motor claims figures. An insurance policy is nothing more than a promise that a client will be compensated when a certain risk occurs. Contractually binding nonetheless, this promise is therefore the central pillar of the insurance system as a whole and this principle managed to bring the global insurance industry to proportions that the LLOYD's coffee house attendants could only dream of. Time to wrap up 2013! After 12 months bringing you the latest and most relevant news of the 32 insurance markets of the Central and South-Eastern Europe and the CIS regions that we monitor, our hope here, in the editorial office of xprimm.com is that XPRIMM News will be among one of this year's most pleasant experiences. The recent tragedy that struck in Sardinia, when many of the islanders saw their homes destroyed by floods, raised again the issue of putting in place a national legislation for compulsory insurance for damages caused by this kind of calamity. It is not the first time when a dramatic, catastrophic event puts this problem back on the public agenda. The same happened in 2009, after the L'Aquila earthquake. And still... the law doesn't exist yet and the share of the insured claims seems to be small enough not to arouse any interest for the public debates. "Solvency II - On Your Mark, Get Set, Go" is the title under which will take place, in less than one week, the third section of the EIOPA Conference. In fact, the Solvency II topic was a constant presence on the Conference's agenda over the last few years, each time being emphasized the unsolved issues which determined the new solvency regime's introduction to be several times postponed. Hopefully, this year it seems, at least judging by the title, we will see no delay. In addition, the recent agreement between the European Parliament, Council and Commission on the Omnibus II Directive is an important step for the new Solvency II risk-based regulatory regime implementation to remain on schedule. One year ago, the ACEA statistics regarding the passenger cars sales in the EU showed the worst month of September since ACEA recorded new registrations in the EU27 in 2003. One month ago, the association reported a 5.4% y-o-y growth in sales for the same category of vehicles. Should motor insurers see this news as a good sign for the future of their business? Considering that the nine months sales figures still show a negative trend ... maybe it is too early for optimisms. What are than the rebound chances for the MOD insurance line, especially in the emerging markets where this market segment is closely linked with the car sales dynamic? Is Poland the CEE barometer? Look at Poland when you need to see the CEE trend, may be a simple rule for those who need to get oriented in the CEE insurance landscape. But is it really Poland the region's barometer? In strictly financial terms, the answer is yes. But figures are not enough to get acquainted with the regions' dynamics, especially taking into consideration the area's diversity.